The environmental and cultural influences of the Pacific Northwest were engrained in the the minds of the Original Grain founders from an early age. Growing up in the expansive natural beauty of the great outdoors shaped an aesthetic that has come to define the OG brand. We are Original Grain. Always original, never duplicated. We are born of Pacific Northwest roots and embody the characteristics of our heritage: a love for the outdoors, genuine pride in creating handcrafted goods, and appreciation for original style and design. We believe in being bold, authentic, and creating something from nothing. We believe in the vision, the craft and the process. The grit. The hustle. Late nights and lessons learned. We celebrate those that form their own path, create their own style, and display it with confidence. We believe in the timeless element of style while retaining its core principles. It isn’t a magazine cover, endorsement, label, or price tag. Style is how you present and carry yourself. Style is authentic. We are Original Grain. 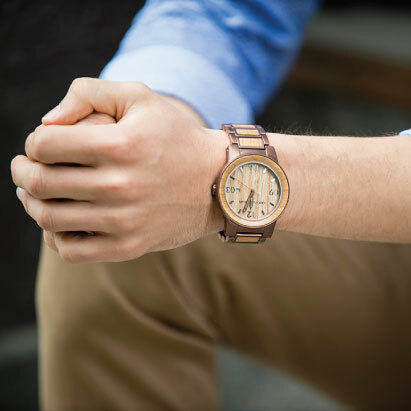 We are purveyors of style—forged of wood, steel, and a fresh approach to classic traditions. We hold ourselves to a higher standard while creating original timepieces that reflect our craftsmanship, authenticity, and quality. In doing so, no two watches will ever be identical. We’re a close-knit family instilled with humble pride and determination. Every watch represents these values, and every bearer is part of our family.